You’ve made the decision to change your eating habits. With its focus on clean eating, the ketogenic diet is a popular, effective way to change your habits for the better. But where to begin, if you are new to the diet plan? Our experts researched and reviewed more than twenty options to bring you a list of the best ketogenic diet books. Before you start shopping, take a look at some of the specifications to keep in mind, so you end up with the right book for you. Format: Some people prefer to fold their books for comfortable reading. Others enjoy the longevity and durability of a hardcover. Still, others want an ebook, so they can bring it with them on their devices. Check this spec to determine the formats available for each book. 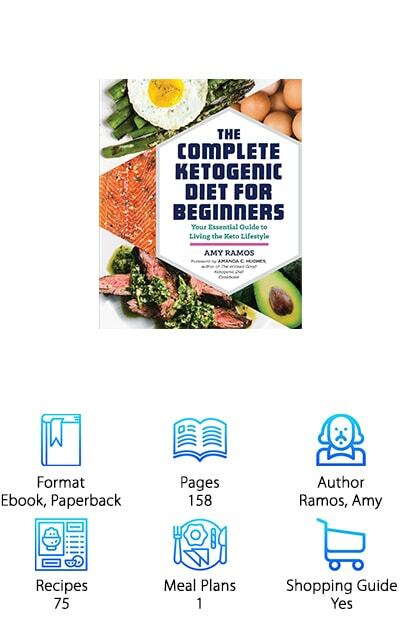 Pages: You’re either looking for a short book to give you basic information about the ketogenic diet, or you want something detailed and filled with information and recipes. Either way, we’ll let you know how many pages are in each book. Just check here. Author: Maybe you’re looking for a specific author or you’d like to read something written by a popular dietician. If the source is important to you, look at this spec. We will let you know who the author is for each book. Recipes: Recipe ideas are great to get you started on your new journey. You’re probably wondering what to make with all the new food combinations and restrictions. Check this spec for information on how many recipe ideas each book contains. Meal Plans: Beyond recipes, you’ll need to know your options for meal planning. Meal planning is a way to save time, especially during the busy work week. If you’re looking for ideas for planned easy lunches and dinners, check this spec for the number in each book. Shopping Guides: Recipes and meal plans are great, but what about when you’re at the market? You might not have time to comb through each recipe and write down what you need. A shopping guide comes in handy. Check this spec to find out if the book has one. Now that you know what to look for, you’re probably wondering what is the best ketogenic diet book? We’ve done our research to bring you a comprehensive list, so you find the option most compatible with your goals. If you’re ready to make a change and you’re looking for a ketogenic diet book buying guide, you’re in the right place. In a hurry? Check out our top and budget picks first. Let’s get shopping! Leanne Vogel’s The Keto Diet provides a complete resource on the ketogenic lifestyle. 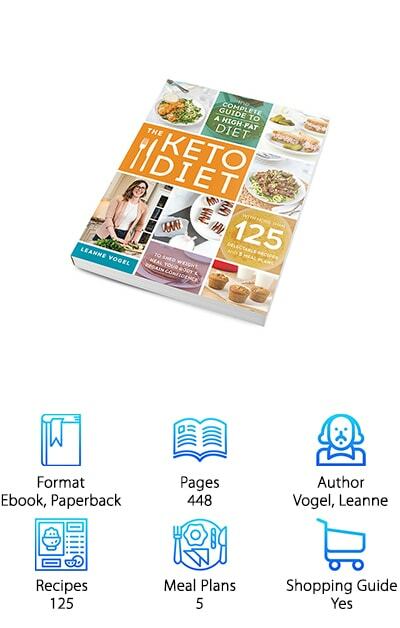 Perfect for beginners and seasoned keto dieters alike, this book is a 448-page publication, chock full of valuable information. It boasts five 28-day meal plans with 125 recipes and a shopping guide, which is great because you won’t be left wondering what to buy at the market or what to make when you get home. The extensive coverage also includes all the tools needed to create your own customized nutrition plan. So, if you’re vegan, or have other dietary restrictions, The Keto Diet contains plenty of options just for you. Also included: lists of popular food replacements and yes/no foods, to help you maximize the effects of the diet. The extensive amount of data and features make this book one of our favorites among the top ketogenic diet books. If you have questions about keto, this book has the answers. 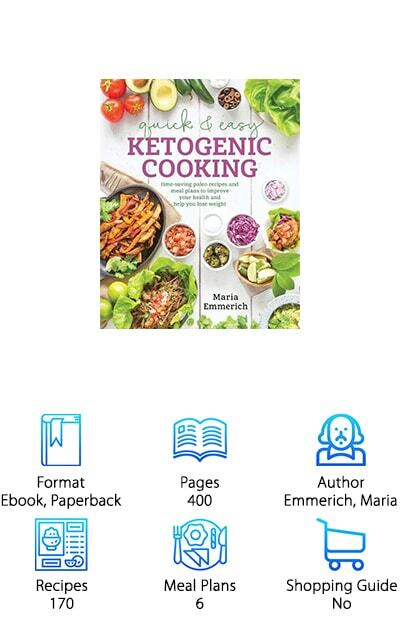 Nutritionist and popular food blogger Maria Emmerich provides an excellent choice for our budget pick of the best ketogenic diet books, with her well-loved publication, Quick & Easy Ketogenic Cooking. Filled with recipes that are easy to make and specifically designed for ketosis, this book has all the answers for any novice unsure about how to make the switch. Even better, it is perfect for anyone who follows a specific diet already, because it incorporates plenty of options for dairy-free, nut-free, egg-free, and meat-free eaters. The fast and simple recipes take the stress out of making a lifestyle change, so you can easily transition without wasting time on research and tricky meal preps. Complete with six meal plans and even suggestions for sticking with keto at restaurants, our budget pick delivers a load of information at an affordable price! If you’re looking for a complete, but easy guide to keto eating, look no further. More recipes and fewer specialty ingredients are what Bacon & Butter delivers. If you’re looking for easily accessible recipes that don’t require you to re-learn everything about the way you eat, this book takes the (ketogenic) cake! Available to download as an ebook or in paperback form, you can cozy up with information on how the ketogenic diet works and 150 recipes that help keep your body in ketosis. We think this book’s simple, down-to-earth approach to making a lifestyle change makes it a top contender for the best keto diet book available. Beyond the catchy, fun title, you’ll be introduced to an array of recipes made with whole foods that are high in fat and low in carbohydrates. The author, Celby Richoux, was overweight and suffered from low energy levels before adopting the ketogenic lifestyle. You’ll experience her journey firsthand and learn what helped her lose weight and maintain her goals. Bacon & Butter is a great guide with a personalized approach! 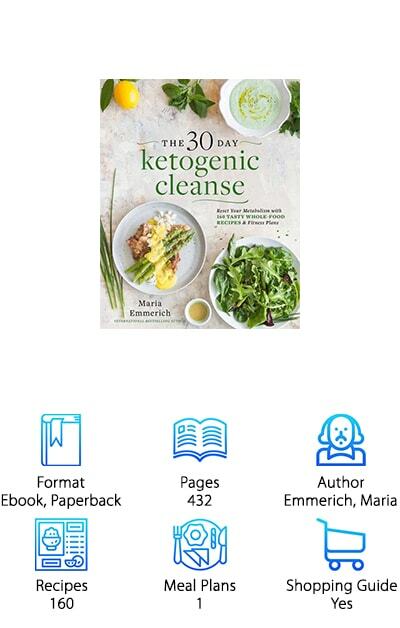 The 30-Day Ketogenic Cleanse by Maria Emmerich is a complete guide to the ketogenic diet with 30 days of meal plans. This ketogenic diet book contains a detailed explanation of how sugar can lead to weight gain and possible even inflammation. You will be introduced to 160 recipes with a whole food emphasis, and a bonus chapter with slow cooker recipes for the busy cook! Shopping lists are included with the meal plans, so you won’t struggle at the grocery store. 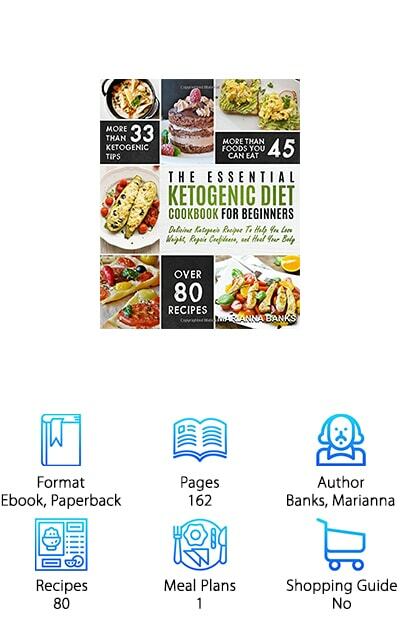 Complete with tips for maintaining the keto lifestyle, this book has everything you need to start your ketogenic diet journey. Best of all, it includes a guide for eating keto after the 30-day cleanse is over. All recipes are dairy-free and nut-free, so those with allergies won’t want to miss out on this awesome cleanse! When you’re ready to try the ketogenic diet, but have no idea where to begin, The Complete Ketogenic Diet for Beginners is a great place to start! Start your journey off right, thanks to this easy-to-understand publication, chock full of 75 simple recipes that use five main ingredients or less for every meal! Don’t have a lot of time to learn everything you need to know? Can’t spend hours in the kitchen? That’s ok! This book will give you all the information you need, including a 14-day meal plan with shopping lists and charts that illustrate calories and nutritional information. If easy-to-make peanut butter cup smoothies, chicken-avocado lettuce wraps, and rosemary-garlic lamb racks sound good to you, then you’re in the right place! Check out ketogenic diet book reviews and you’re sure to find this affordable option a favorite among keto dieters. A mere 158 pages contain everything you need to know to put your body in ketosis! On a budget? You’ll love The Wicked Good Ketogenic Diet Cookbook, both for its affordable price and its emphasis on recipes that don’t break the bank! 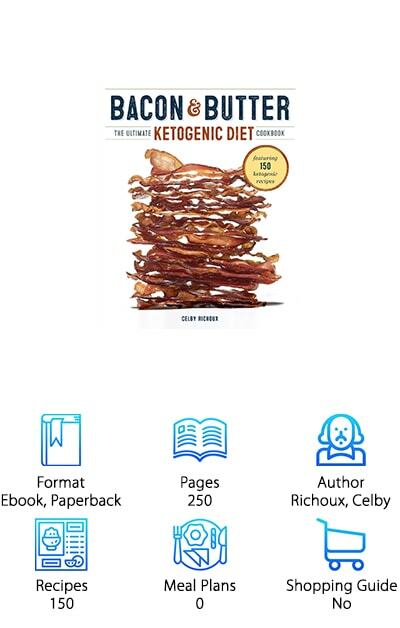 When you search, “best book about ketogenic diet,” you’re likely looking for a publication with loads of recipes that work with any budget. You’re in luck because we found the perfect pick for the wallet-conscious customer. Chef Amanda Hughes brings you 175 keto recipes that are easy-to-prepare, low in carbs, and high in fat. And here’s the kicker: Each recipe comes with a price point, as well as tips on how and where to shop to save money! The introduction provides information on the ketogenic diet, so you feel well-versed and confident on how to stay on track for success. The author is a personal fan of the ketogenic lifestyle, having lost weight and gained energy on the plan herself. Personal and practical, The Wicked Good Ketogenic Diet is a must-have! You may want something tried and reviewed by many! 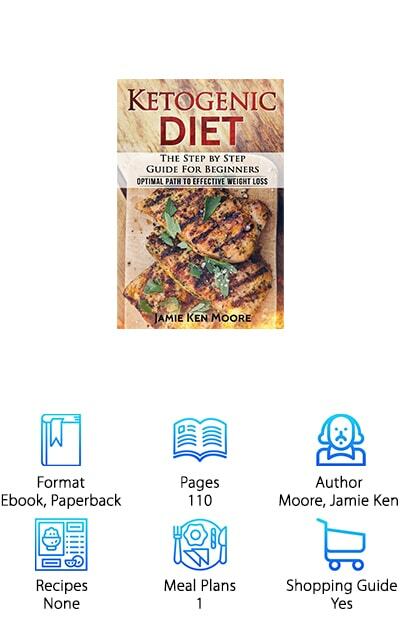 If that’s the case, check out the best selling ketogenic diet book Ketogenic Diet: The Step-by-Step Guide for Beginners by, Jamie Ken Moore. Boasting stellar ratings, this short, easy-to-follow book is overflowing with valuable information about the ketogenic diet. Complete with a meal plan, recipes, and a grocery list to make life easy, it has everything you need to start and maintain a ketogenic diet. If you’re ready to start enjoying savory foods and try the ketogenic diet for yourself, then you won’t want to miss this book. It’s perfect for novice dieters and can help anyone turn a “diet” into a lifestyle. And, as a bonus, each of the recipes in the meal plans breaks down nutritional content, including fat, carbs, protein, and calories! You don’t have to take the journey alone, thanks to Moore’s personal testimony. If you want a quick, informational read, look no further. The Keto Reset Diet is all about improving your metabolism and losing weight. It’s to the point and super practical! If you search for the best books on ketogenic diet, you are sure the find this gem among other great sources of information. 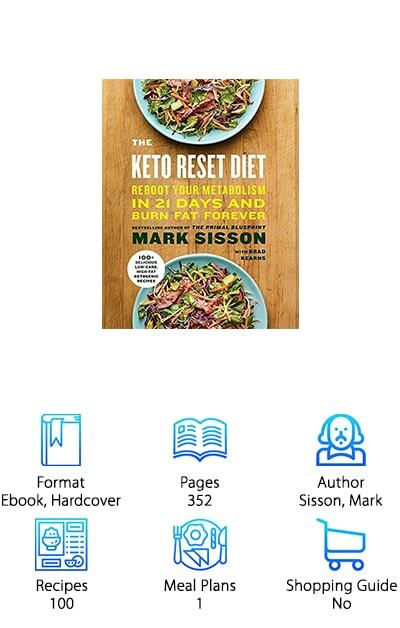 Discover what the ketogenic diet is, how it works, and why it could be the answer for losing weight and gaining energy, thanks to author Mark Sisson’s detailed account. With more than 100 recipes and a pre-set meal plan to help you reprogram your metabolism and promote metabolic flexibility, The Keto Reset Diet gives you all the tools you need to achieve lasting results. 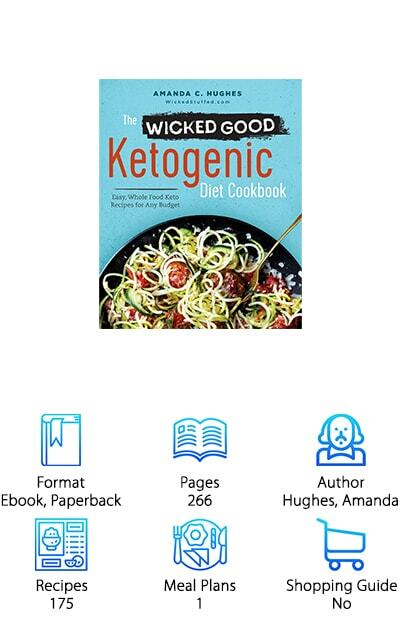 Available for the ebook, as an audiobook, or in hardcover, you can access all the best keto tips with the touch of a button or display the book in your kitchen, knowing it is durable enough to last through your cooking sessions. If you’re ready to try the ketogenics diet and read the advice of a former world-class endurance athlete and paleo food blogger then this book is the perfect choice for you. 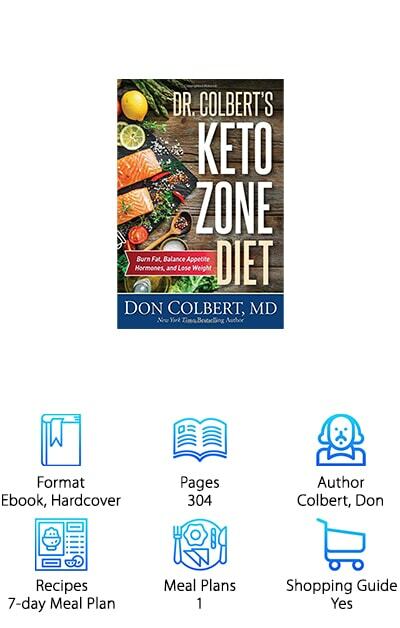 Written by a medical doctor, we think Dr. Colbert’s Keto Zone Diet is one of the best ketogenic books on the market today. A comprehensive guide to how the keto diet works, this book goes beyond recipe ideas. It offers a 7-day meal prep to follow, and a shopping list, but delves deep into the science and facts behind a ketogenic lifestyle. Dr. Colbert does an excellent job at explaining the basics behind a high fat, low carb, and moderate protein diet and helping you understand if the ketogenic diet might be something you want to try. The book is straightforward and includes a lot of helpful information. And here’s the kicker: this book includes a helpful guide for clearing your home of unhealthy foods! This is a great starting point to get rid of all unhealthy temptations that will make your keto journey tougher. Give it a try! On your list of the best ketogenic diet cookbooks should definitely be The Essential Ketogenic Diet Cookbook for Beginners. Boasting 80 recipes, information on more than 45 foods you can eat, and 33 ketogenic tips, the data in this book can help you start your lifestyle change. Easy to read with a focus on the basics, this 162-page publication provides plenty of information on how the keto diet works, how to maintain it-- even when you’re out to eat, and 80 recipes with a meal plan, to get you started on your journey. If eating delicious, whole food recipes sounds right for you, then don’t miss out on Banks’ great read. And it’s available in ebook format or paperback, so you can take it with you wherever you go, for tips, reminders, and motivation!